When we approached the entrance of The Kentucky Theater in Louisville over the weekend, a cascading banner quoted The New York Times: "THE BEST MUSICAL OF THIS CENTURY!" To all other musicals, them's fightin' words. I looked at S with a very sassy, "Wow. How bold of them." I had been waiting to see this musical for two years, and although the Broadway tour didn't quite come within arms reach of Knoxville, a four-hour drive to Louisville, KY, seemed justified. That would be four hours one-way, y'all. I'm not kidding about my anticipation of this show. Thankfully, S was impressed with the 2012 Tony Awards televised performance and read rave reviews, so he committed to helping his wife see this warm yet subversive production. To Louisville we went, and we laughed our asses off. To say that it was hilarious and witty doesn't do it justice. 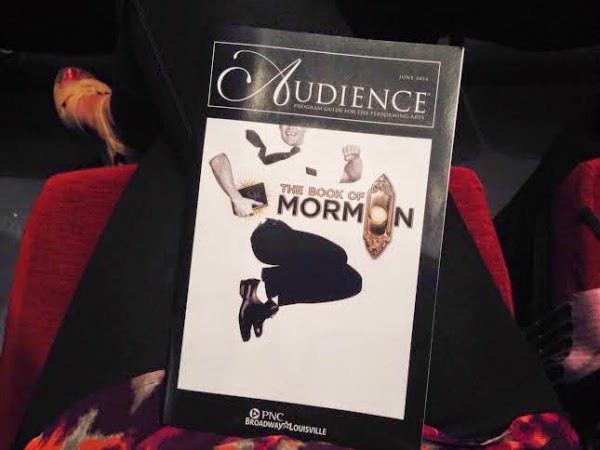 I've seen a lot of spectacular theater in my life, but The Book of Mormon stands out in such a unique way. Granted, we are only 14 years into this century; that cascading banner did not overstate. This show is killer. From script to score to choreography, it takes the cake! I was asked on Instagram, "What did you think? I'm LDS, and this always makes me a little nervous but I don't actually know much about it." So without subjecting myself to a huge religious or political debate on this blog, I want to address this concern about this musical -- or anything that questions a religion, really. On top of that all fluffy stuff I just said, you must also accept the F word said several times over, politically incorrect terms from the mouths of innocents that will make you gasp, gay jokes, and a whole lot of good old-fashioned belting and tap dancing. I promise they're in there for more than just shock value. It's a super witty show! From what I've read from LDS people and looked up for myself, the show does not say anything about the Mormon church/faith that is untrue, so there's that. To me, life shouldn't be taken so seriously that you refuse to see the world through a wider lens or that you can't laugh at your own hardships (and choice words and provocative humor). I'm going to say this loud and clear: You don't have to agree with everything you see/hear, but sometimes you'll realize by seeing/listening that you're being called out on your own BS, and that is a good thing to recognize. It was evident that the Mormon Church was not too offended to take out a three-page ad in the program, complete with the crafty text "The book is always better. You've seen the show. Now read the book." No joke. Mormon Church, I applaud you for "sticking it to the man" with that one! um, I absolutely made it to the end of the post :) I loved BoM (I've seen if a few times out here in Los Angeles). I'm hoping to see it again if the tour returns! Can't afford to see it this time in San Diego. I'll catch it next time. I made it to the end of your post! It was a great read. Thanks for your commentary, Linz! Perfect blog post. Absolutely perfect. Honestly, I saw the play two days after Christmas in Charlotte last year and I was honestly afraid to say on Twitter/IG/blog that I saw it because I was afraid of the backlash. The show did make me blush multiple times, but I never stopped laughing. Nick and I loved it. You've made me realize how silly I was to try to hide how much I loved it!